We make dozens, if not hundreds, of choices each and every day. We “vote” on everything from, “where to go to lunch” and “what to do on Friday night” to “who should be homecoming king/queen.” And yet, each of us is also faced with a much bigger and more important election in our own lives that has both earthly and eternal implications. 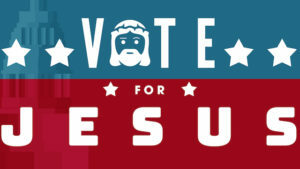 Your candidates are “the world” or Jesus. Do you know where each candidate stands on all the issues? Who can you trust the most? Are you willing to campaign for the candidate of your choice? Are you even going to show up to vote? Ultimately the choice is yours. It’s a huge decision, one that shouldn’t be taken lightly and one that requires a thorough investigation. So, who are you going to vote for? Be sure to check it out right here!